Thanks to its simplicity and efficiency, water sterilization by UV radiation has developed extensively in the recent years. UV radiation at 253.7 nm is part of the solar radiation, and is reproduced artificially. UV radiation thus produced is of much greater intensity than sunlight – therefore suitable for water sterilization. This particular disinfection method is known as one demolishing legionella, microbes, bacteria, viruses and protozoa, while having no negative impacts on the environment. This is the ideal method to remove micro-organisms from water, and thus make it potable in terms of bacteriology.Water treated in this way cannot be regarded as of drinking quality unless its chemical properties are compliant to relevant standards. Rainwater: UV-sterilization of rainwater will allow for a wider range of application and safe use. Drilling water, boreholes: UV-sterilization of well water will prevent any pathogenic contamination. 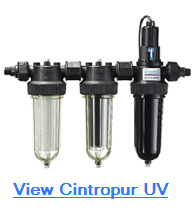 Tap water: UV-sterilization of tap water will ensure premium quality water satisfying even the highest demands. Spring water, surface water: UV-sterilization of such waters will provide constant water quality in terms of bacteriology. Water stored in tanks (in caravans, boats, etc.) UV-sterilization will preserve the healthiness of water kept in tanks.